Twelve rebels from Colombia's Farc group have been reintegrated into civilian life, after becoming the first group to complete a UN-monitored disarmament process. 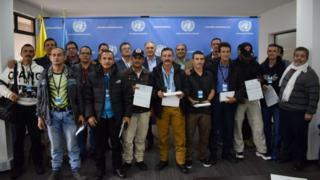 The 12 men received certificates from the UN mission at a ceremony in Bogota. Thousands of rebels have handed over their weapons since the Farc signed a peace agreement with the government last year. The deal put an end of more than five decades of conflict. Some 7,000 members of the Revolutionary Armed Forces of Colombia (Farc) are still at demobilisation zones set up across Colombia, waiting to be registered so they can rejoin civilian life. Friday's event marked the beginning of "a continuous process begins to certify the Farc members who are making the transition to civilian life after laying down their arms," the UN said in statement. The historic peace accord was reached after four years of negotiations held in the Cuban capital, Havana. Under its terms, all weapons should have been handed over by 1 May, but the UN says there have been delays. For his efforts to reach peace with the Farc, President Juan Manuel Santos was awarded last year's Nobel Peace Prize.